The 5th fiction book in Susan Wise Bauer's Well Educated Mind list of great reads is Charles Dicken's 2nd Novel Oliver Twist. Originally published in serial form in Bentley's Miscellany, it ran monthly from February 1837 through April 1839. For those who aren't familiar with the story, it's about a young orphan who ends up living in London with a gang of pickpockets. Dickens used the story to call attention to the treatment of orphans, child labor, poverty and the seedier side of London's criminal element. Treats of the place where Oliver Twist was born, and of the circumstances attending his birth. 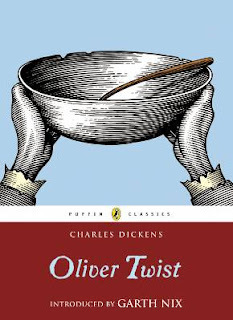 Although I am not disposed to maintain that the being born in a workhouse, is in itself the most fortunate and enviable circumstance that can possibly befall a human being, I do mean to say that in this particular instance, it was the best thing for Oliver Twist that could by possibility have occurred. The fact is, that there was considerable difficulty in inducing Oliver to take upon himself the office of respiration,- a troublesome practice, but one which custom has rendered necessary to our easy existence; and for some time he lay gasping on a little flock mattress, rather unequally poised between this world and the next: the balance being decidedly in favour of the latter. Now, if, during this brief period, Oliver had been surrounded by careful grandmothers, anxious aunts, experienced nurses, and doctors of profound wisdom, he would most inevitably and indubitably have been killed in no time. There being nobody by, however, but a pauper old woman, who was rendered rather misty by an unwonted allowance of beer; and a parish surgeon who did such matters by contract; Oliver and Nature fought out the point between them. The result was, that, after a few struggles, Oliver breathed, sneezed, and proceeded to advertise to the inmates of the workhouse the fact of a new burden having been imposed upon the parish, by setting up as loud a cry as could reasonably have been expected from a male infant who had not been possessed of that very useful appendage, a voice, for a much longer space of time than three minutes and a quarter. As Oliver gave this first proof of the free and proper action of his lungs, the patchwork coverlet which was carelessly flung over the iron bedstead, rustled; the pale face of a young woman was raised feebly from the pillow; and a faint voice imperfectly articulated the words, "Let me see the child, and die." "Oh, you must not talk about dying yet." "Lor bless her heart, no!" interposed the nurse, hastily depositing in her pocket a green glass bottle, the contents of which she had been tasting in a corner with evident satisfaction. "Lor bless her dear heart, when she has lived as long as I have, sir, and had thirteen children of her own, and all on 'em dead except two, and them in the wurkus with me, she'll know better than to take on in that way, bless her dear heart! Think what it is to be a mother, there's a dear young lamb, do." Apparently this consolatory perspective of a mother's prospects failed in producing its due effect. The patient shook her head, and stretched out her hand towards the child. The surgeon deposited it in her arms. She imprinted her cold white lips passionately on its forehead; passed her hands over her face; gazed wildly round; shuddered; fell back- and died. They chafed her breast, hands, and temples; but the blood had stopped for ever. They talked of hope and comfort. They had been strangers too long. "It's all over, Mrs. Thingummy!" said the surgeon at last. "Ah, poor dear, so it is!" said the nurse, picking up the cork of the green bottle, which had fallen out on the pillow, as she stooped to take up the child. "Poor dear!" "You needn't mind sending up to me, if the child cries, nurse," said the surgeon, putting on his gloves with great deliberation. "It's very likely it will be troublesome. Give it a little gruel if it is." He put on his hat, and, pausing by the bed-side on his way to the door, added, "She was a good-looking girl, too; where did she come from?" "She was brought here last night," replied the old woman, "by the overseer's order. She was found lying in the street. She had walked some distance, for her shoes were worn to pieces; but where she came from, or where she was going to, nobody knows." The surgeon leaned over the body, and raised the left hand. "The old story," he said, shaking his head: "no wedding ring, I see. Ah! Good night!" What an excellent example of the power of dress, young Oliver Twist was! Wrapped in the blanket which had hitherto formed his only covering, he might have been the child of a nobleman or a beggar; it would have been hard for the haughtiest stranger to have assigned him his proper station in society. But now that he was enveloped in the old calico robes which had grown yellow in the same service, he was badged and ticketed, and fell into his place at once- a parish child- the orphan of a workhouse- the humble, half-starved drudge- to be cuffed and buffeted through the world- despised by all, and pitied by none. Oliver cried lustily. If he could have known that he was an orphan, left to the tender mercies of churchwardens and overseers, perhaps he would have cried the louder. Link to your most current read. Please link to your specific book review post and not your general blog link. In the Your Name field, type in your name and the name of the book in parenthesis. In the Your URL field leave a link to your specific post. If you don't have a blog, tell us about the books you are reading in the comment section of this post. Yes, you are off the hook and don't have to read Dickens. I'm not sure if I've read anything by Dickens. I have A Christmas Carol on my shelf but I can't remember reading it. If you can't remember, you probably didn't. I finally read A Christmas Carol last year and it was different enough from the movies to enjoy it. Loved Oliver Twist! Love Dickens! Glad to hear it. I'm trying to get into it. I love this event. I invite you to list on Book Blog 411. I certainly could list it myself, but I would appreciate you providing me with the proper information for the listing. It's free, of course. Thanks! I'll stop by to check it out. In other news, I am loving this challenge. 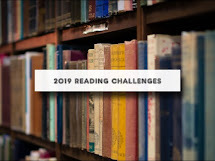 I have read 5 books this year and I am enjoying reading what everyone else is up to. Happy you are loving the challenge.